Sail, sail, sail away on an adorable little boat with a picture of your loved ones close at hand! Just make sure you get back in time for dinner! 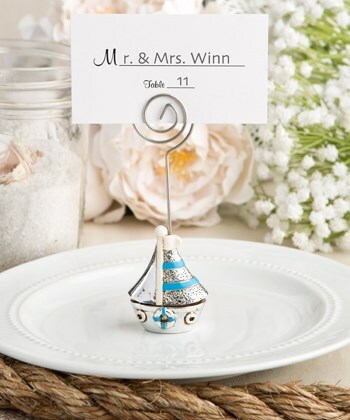 These splendid little boats will delight your guests when they find their seating marked with a place card that is about to sail away! Add a classy nautical theme to your event with these favours. The boat is fashioned from poly resin and is covered in a silver vacuum plated finish. One sail is smooth and the other has a fun pebble finish. Blue and white detailed accents adorn the sail and bottom of the boat. Attach a place card to the coiled wire for a fun décor effect at your next event. The guests can use the boats at home for holding photographs of loved ones. These are ideal for weddings, showers, christenings and other grand occasions! Size of boat is 4 1/2" x 1 1/2"
Create a fun nautical theme at your next occasion with this classy favour.